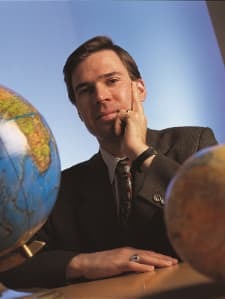 Witold J. Henisz is the Deloitte & Touche Professor of Management in Honor of Russell E. Palmer, former Managing Director at The Wharton School, The University of Pennsylvania. His research examines the impact of political hazards on international investment strategy including efforts by multinational corporations to engage in corporate diplomacy to win the hearts and minds of external stakeholders. In a National Science Foundation funded project he showed that markets value stakeholder engagement twice as much as the net present value of the gold ostensibly controlled by 19 publicly traded gold mining companies. He then assesses the contingencies that influence the choice of which stakeholder these firms should reach out to in order to positively influence valuation as well as how to best develop a cooperative relationship with that stakeholder. He draws upon these insights as well as examples from large scale construction management, sustainable tourism, development and military counterinsurgency in his book project Corporate Diplomacy: Building Reputations and Relationships with External Stakeholders. His earlier work analyzed (1) the political and economic determinants of government attempts to redistribute investor returns to the broader polity; (2) the strategic responses by organizations to such pressure; and (3) the determinants of the success of individual organizations in withstanding such pressure. His research has been published in top-ranked journals in international business, management, international studies and sociology. He served as a Departmental Editor at The Journal of International Business Studies and now serves as an Associate Editor at Strategic Management Journal. He is a Fellow of the Academy of International Business. Witold has won multiple teaching awards at the graduate and undergraduate levels for his elective courses that highlight the importance of integrating a deep understanding of political and social risk factors into the design of an organization’s global strategy. These courses incorporate multiple cases that he has authored as well as capstone KEROVKA crisis management simulation for which he served as the academic director. He led the redesign of the global required course in the Wharton curriculum. He teaches extensively on the topic of ‘Corporate Diplomacy: Building Reputations and Relationships with External Stakeholders’ in open enrollment and custom executive education programs. Witold is currently a principal in the political risk management consultancy PRIMA LLC whose recent consulting clients include Anglo Gold Ashanti, Rio Tinto, Lockheed Martin, Shell Corporation, Dundee Precious Metals, Maritime Financial Group, The World Bank, The Inter-American Development Bank and the International Finance Corporation. He previously worked for The International Monetary Fund.